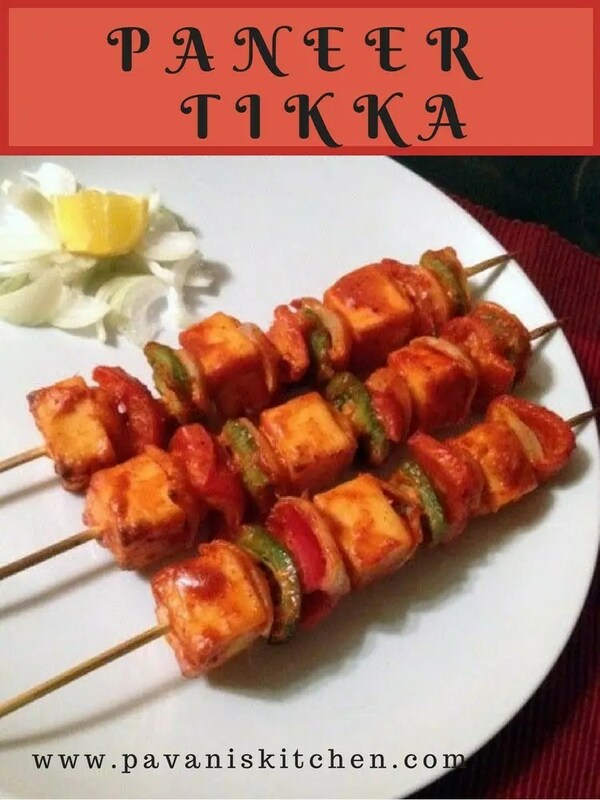 Today I am posting a recipe which we eat often at restaurants that is Paneer Tikka,which we can make this at home more delicious than the restaurant one.Here goes the recipe..
1.Take a bowl ,add all the ingredients under marination and mix well. 2.Add the paneer,capsicum,onion and tomato.Mix well. 3.Cover the bowl with cling film and marinate it for 2-3hours. 4.Soak the skewers in water at least half an hour before grilling. 5.Preheat the oven to 200degress. 6.Arrange the marinated pieces onto the skewers. 7.Cook the tikkas for 8-10 minutes on both sides by turning them. 8.Apply oil or butter to the pieces in the middle. 9.Remove them from oven ,allow to cool 2 minutes and enjoy paneer tikka with your favourite dips. 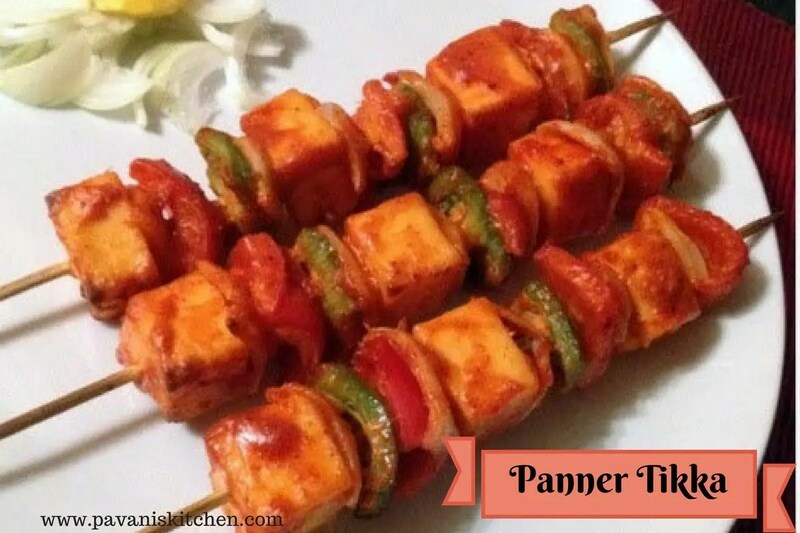 Today I am posting a recipe which we eat often at restaurants that is paneer tikka, which we can make this at home more delicious than the restaurant one.Here goes the recipe. Take a bowl, add all the ingredients under marination and mix well. Add the paneer, capsicum, onion, and tomato.Mix well. Cover the bowl with cling film and marinate it for 2-3hours. Soak the skewers in water at least half an hour before grilling. Preheat the oven to 200degress. Arrange the marinated pieces onto the skewers. Cook the tikkas for 8-10 minutes on both sides by turning them. Apply oil or butter to the pieces in the middle. 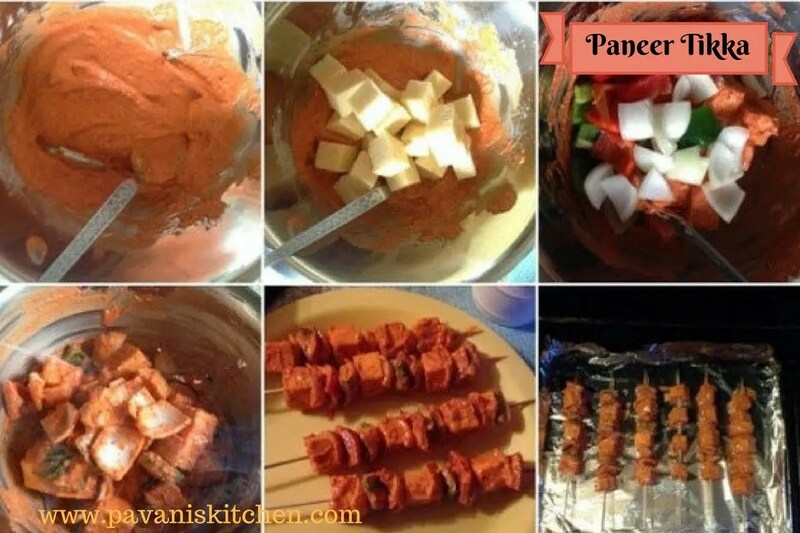 Remove them from oven, allow to cool 2 minutes and enjoy paneer tikka with your favourite dips. Very nice clicks!! The recipe sounds good…even better than wat we usually order!! Paneer tikka is just tempting me to have some.